Tarot Cards are often the start of a lot of people’s psychic lives, if you read our psychic reader profiles regularly you will know that many of them were given a deck of tarot cards in their childhoods and their skills have grown from there. Tarot decks are now readily available to purchase in mainstream book stores, there is not the need there once was to visit a specialist occult shop. Most decks come with instructions, so you can get to grips with tarot card meanings, different spreads and combinations of cards allowing you to practise the art yourself. However, it can take years and years for a person to become completely proficient in reading the cards. The thing that must be kept in mind is that the cards should only be used as a guide, not as an absolute message. Experienced Tarot readers know that the cards offer a framework, but that they must apply their own psychic ability to both the cards and the querent if they wish to get a picture of what the future holds. The origins of the tarot have been lost in time; but there is some evidence to suggest that they originated in the North of India and were brought out of that region by the Romany people. However there has also been speculation that the cards originated in Northern Italy or China. The tarot card deck is made up of seventy eight cards, twenty-two Major Arcana and fifty-six Minor Arcana. The Major Arcana depicts symbolic figures, the symbols are universal and are drawn from magical belief, but are subject to broad interpretation. The sequence of 0 to 21 represents the soul’s journey to awareness, starting with The Fool card and ending with The World card. The Minor Arcana is the tarot card deck that is an ancestor of our traditional playing cards with Clubs, Hearts, Diamonds and Spades, numbered two through to ten and the Queen, King and Jack in each suit. The difference is that of the Page card which is an extra court card found in Tarot decks. The fours suits of the Minor Arcana have names and meanings – Cups (good fortune & love), Pentacles (financial & material success), Wands (enterprise & knowledge) and Swords (ill fortune or difficulties). There are various Tarot Card spreads, normally the pack is shuffled and then laid out face down in the chosen spread. Each card is turned over and interpreted, taking into account the individual cards meaning, the position it was placed in, whether it was reversed or upright as well as the spread as a whole. 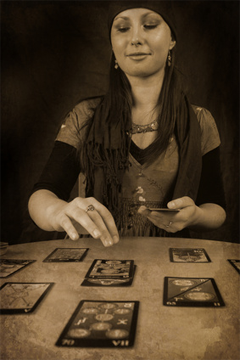 Visit our Psychic Readers page to see all of readers that use Tarot in their readings.